But, but, it got an academy award. It must be true. In the interest of fairness and accuracy, you can be sure this analysis an others like it will be broadcast far and wide on the MSM. Polar bears became a focal point for environmentalists after former Vice President Al Gore featured them in his 2006 global warming documentary, “An Inconvenient Truth". 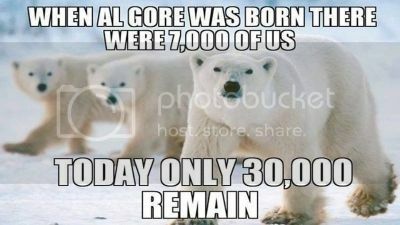 According to Al, Chicken Little, and assorted hysterics the bears were disappearing because of global warming.